Multifunctional furniture takes new and new forms. The classic designs take on new shapes and twists whether to save space or provide multiple functions. Bed 42 is an award-winning design by Manadaº design studio. Bed 42 designed by Manadaº design studio is an unusual hybrid of a bed and a desk that has won an Interior Innovation Award 2012. 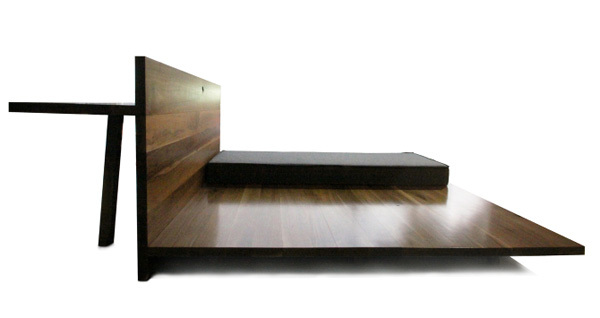 The desk is hidden by the bed’s headboard which also functions as a divider for the sleeping and working area. A great solution for a bedroom home office. Bed 42 is made of wood and was 100% handcrafted. The design is both interesting and functional. It looks classic yet the desk and the high headboard bring in the unexpected twist. The higher headboard also helps to hide a desktop from the sight.